Bhargava, a young civil engineer turned producer of the first ever Telugu full-length animated feature film Kittu (2006), foresees bright future for the animation industry in Andhra Pradesh. "Animation industry is like a giant in Hollywood. They find India the third grade market for animated films. They really don't care about our country. I want to change this upsetting view. Kittu is just the tip of the iceberg. The real journey has just started to tap the animation potential in Tollywood," he says. Having received the newly-formed National Award for Best Animated Film for the traditionally-animated Kittu (the exploits of a monkey called by that name) from Her Excellency President of India a few days ago, Bhargava, a rising filmmaker, shared his joy with Idlebrain.com. Tell us what prompted you to become a filmmaker? Actually, I was a civil engineer. For reasons which I can't explicitly tell you, the film industry lured me, tempted me. I found a haven in the animation industry. 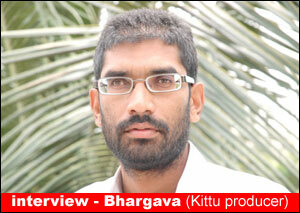 We started the Bhargava Pictures Animation Studio in 2002. We started training classes for the animator-aspirants. That time, to tell you roughly, there were just 3000 animators in India. In about a year, we trained nearly 1500 students in our studio. As part of the assignments and the practical classes, we initiated Kittu. For about three years, the film underwent grinding and grinding and result was the finest output worth to bag a National Award. Our efforts were duly recognized. This made me seriously think about the potential for animation industry in Tollywood. The segment has become part and parcel of the entertainment world. But, it remains disorganized. The scenario in Bollywood just popped up on the surface. Definitely, a big boom awaits us. How much did it cost you for Kittu? Is animation commercially viable for us? See, we spent somewhere around Rs. 3 crores for Kittu. That time we had animators with us under training. This was exclusive of it. Now, for making Kittu, we need at least Rs. 7 to 10 Crores. Definitely, animation field is commercially viable. I can even say, it comes under a supreme class. People are used to watch animation everyday in the TVs. But, no efforts are made to make the audience accustomed to the animation. If we could do it, we are going to reap the golden harvest. So, when can we expect next animation film from you? May be in a few months, if everything goes well. Ours is a very small contribution with Kittu, but we are proud of it. The recognition which it brought us will go a long way. It enhanced our credibility. Winning of National Award further armed us with potential to approach the corporate groups. We are in touch with some corporate firms. A lot of funding is required. With or without them, we are going to launch our project in the coming months. But, we are concentrating more on doing a world-class movie on the lines of the Hollywood flicks. We hope to approach global giants like Walt Disney and Warner Brothers. Let us hope for the best. What is the contribution to this animation field from the Governments? It's almost nothing. Just everything is in the air. Nothing concrete is done. I don't know whether you are aware or not. An Animation City in Hyderabad is found in the agenda of the Congress government. If it is implemented, then definitely we will have golden days. But, we have to wait. How long, we don't know. I think it is the right context to compare our scenario with the Western world. Leave the US, even in Canada and South East Asian countries, the governments are liberally funding the animation industry. They are providing grants and subsidies. Ironically, the material from our Mahabharath and Ramayan is considered the best potential by foreign production houses and it might be ruling the roost soon. How do you look at the market potential for animation industry? Generally, the Indian animation industry depends much on DVDs and satellite market. I challenge the potential could be expanded by leaps and bounds. The need of the hour is to prepare scripts with universal themes. First of all, we should educate our audiences that we are second to none in this field, but are in the last for reasons of lack of awareness and funding. In fact, if we really want to do an animated film with minimum decent technical standards, we require Rs. 50 Crore. The foreign production houses consider India the second or even the third grace market for their films. Can you tell us one example? Sure. In 2006, about one thousand films were made in India. But, only one animation film. That too a Telugu film. It is 1000: 1. That too it was our Kittu. We are happy and at the same it is painful to know that. Coming to foreign films, these high-budget ventures are released in big cities like Hyderabad. That too in Multiplexes. Again in our city, it will be in the IMAX format. What is the fate of Kung Fu Panda? It just came in IMAX and very few people knew about it. But, in the last few months, a sort of awareness is slowly making its dawn. The animation world in India is looking curiously towards the forthcoming Bollywood animated venture – Roadside Romeo (Oct 24, 2008). An array of Bollywood biggies have come forward to render their voices to the characters in the film. If this could reach the minimum target levels, we are lucky. If comparison is made with Hollywood, where do we (India) stand in the Animation industry? The comparison is impossible. It will be a big joke. But, I am telling you about the technical values. Coming to the scripts and oriental potential, we are the best. There is no subject which you don't find in our ancient literature. They are still live, have immortal potential for all sections of the audiences. To some extent, Bollywood has made its scratch. We are happy. But, there is nothing to get disappointed. See, the animation first started in 1930. Now, we are at least talking big about. Our Kittu also won the National Award. Recognition is made. In the coming years, much more development is certain. To what extent the gaming industry can influence the growth of Animation? It's wonderful. Gaming and animation are like brothers. They are siblings. Unfortunately, the gaming industry is lagging behind in our country. It has just started in our Tollywood with Jalsa. But, something more concrete should be done to take it to the roots of the common audiences. At this stage, profits are not important. I dare say it. For a producer spending crores of rupees, it is not a big thing if he wants to spend lakhs on promotional aspects. This, I think, will pave way for the concrete road to animation industry. It seems you are obsessed with dreams of animation. Why don't you take up distribution of animated Hollywood flicks at the common man areas? Yes. It has been there in my mind. Please consider me as an ardent person welcoming the animation industry. As a single man, my force is limited. But, definitely, a day will come when I would do this (distribution) also. My primary objective is to bring this industry closer to the common man. Awareness should be created among them – that Animation industry is full of life, vigor, action and excitement. What are your immediate projects? We entered into a tie-up with Zee TV concern for making series of films in the coming years. Currently, we are doing Manorama, starring Charmme in the lead. It is a commercial film. It's a thriller. We hope to release it in November.